We've made it another year, and we're all prettier. My shoulder is feeling a bit better and I'm one wisdom tooth lighter (although the swelling is just now going down). I'd like to welcome each and every one of you to 2012. It's going to be a beautiful, juicy year. 3. Finalize your vote by clicking on the link Preditors and Editors sends you via email. Here's the link: Preditors and Editors Voting Page Thank you! The second amazing thing to happen for me and 46 other incredible authors, including Robert Vaughan, Sara Lippmann, Kathy Fish, Len Kuntz, Sheldon Lee Compton, Ethel Rohan, Meg Tuite, Amber Sparks and Gill Hoffs among so many others that I really love, so I'll just stop . . . is . . . 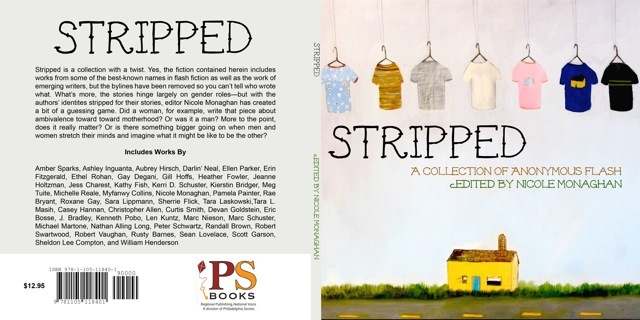 STRIPPED, a Collection of Anonymous Flash,which you can buy from Amazon or Lulu. Thank you to editor Nicole Scarpato Monaghan. Our bios are included, but they're not specific to any story. I love this "stripped" concept. I hope you think I write like any of the writers above. That would make me so much prettier. I found out today that my copies are waiting at the DSL station, and the DSL station is already closed--so I have to wait until Monday. I also have a new darkly comedic story up at Near to the Knuckle. Well done Christopher! Glad to see you receiving some well deserved accolades!